Boston Handmade embraces Earth Day every day of every year. As independent creative business people the members of Boston Handmade produce and sell art and craft locally. Each one of us operates in a small working environment, not pollution spewing factories. These efforts reduce our carbon footprints and those of our customers. Through our choice of materials, methods, and the mindset we keep, "reduce, reuse, recycle" means more to us than a slogan on a blue box. Conserving resources is something each one of us keeps in the forefront of our minds, and harnessing the power of our own hands propels us. THE HOLE THING'S whimsical sweater, accessory, and houseware lines are 'green' because they are made solely from recycled sweaters that have been felted in hot water, and then cut up. The circles that come from the holes that are punched into all the sweaters & scarves get recycled again onto many other products. Frequently vintage buttons are also used in the designs, and the orders are shipped in recycled packaging. Chroma Lab believes the greenest piece of furniture is one that already exists. We restore and redesign vintage furniture with vibrant, modern color and patterns, saving the pieces from landfills and making "new" furniture without using new materials. Chroma Lab uses low-VOC, water-based paints that are high quality but less harmful to the environment. We also try to keep our furniture sales as local as possible here in Boston, saving gas and oil and supporting our local economy. Cozy Cottage Creations: I make all of my work with wool, some of which I get from sheep raised on farms right here in New England. I love working with this all natural, sustainable fiber - it is truly magical! I make several products for children and also teach a knitting class for kids, which are some of the ways I create a natural alternative to plastic toys and useless doo-dads. My hope is that when kids play with something handmade they have less of a desire to have the latest trendy throw-away gadget, and are more at peace by being engaged with the process of creating their heart's desires with their own two hands. 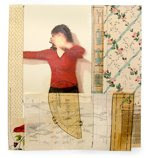 Reclaimed to You: Artwork by Jessica Burko is created by stitching together original photographs with found paper and discarded materials such as wallpaper and used sewing patterns. "I use discarded materials in my work as a way to connect with others - - to the people who touched the paper, read the books, valued what then lost its worth over time. My work also performs a dual purpose as it is created by upcycling/recycling I am exemplifying the 'waste not want not' way of life." 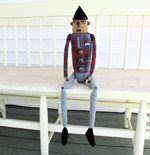 Mimi Kirchner: My dolls are made of recycled clothing and other textiles that would otherwise be discarded. When I make a robot, I also use vintage and antique clothing hardware- often salvaged from the clothing as I take it apart. Sea Glass Things: My business is solely based on using items that were once discarded by man, whether by his own hand or with help from mother nature. 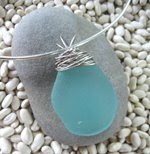 I collect all my sea glass and shipwreck pottery from the beaches of the North Shore, MA and upcycle them into jewelry, clothing, art and home decor. Through my love for our earth, I help clean the beaches transforming trash into treasures for your wardrobe and home! 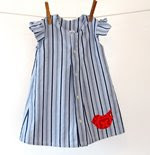 All The Numbers: My upcycled dresses are made using 100% repurposed materials like my husband's old dress shirts or used shirts from thrift shops. Sometimes wives send me their husbands shirts to reclaim for their daughters dress! That's always fun. 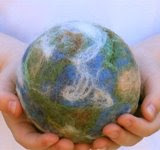 Celebrate Earth Day by supporting these Earth friendly artists, artisans, and crafters!